NIAGARA FALLS, Ont. (January 4, 2015) – It may be an unseasonably warm December, but snow or no snow, the Niagara Icewine Festival will turn the Scotiabank Convention Centre into a winter wonderland. In just its second year in Niagara Falls, the Niagara Icewine Event in Niagara Falls has quickly become the largest Icewine Festival Event in Canada. Organizers are expecting over 10,000 visitors over the weekend events to sip, sample and savour seasonal vintages of the uniquely Canadian icewine from Niagara vineyards and delicious culinary creations from some of Niagara’s top chefs while taking in the grandeur of amazing ice sculptures. 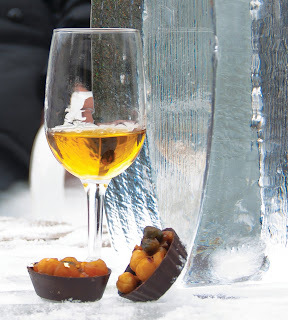 The Niagara Icewine Festival takes place from January 29th to 31st, 2016. Visitors will be able to enjoy more than 20 of Niagara’s best wineries award-winning Wine, icewines and sparkling wines that will be paired perfectly with savoury dishes created by 10 of Niagara’s best restaurants & culinary masters. The entertainment is Headline Friday by local favourites Jonesy, Saturday night headliners are U2 Tribute band Desire and the Beatles tribute band, the Caverners, and concludes Sunday with Soul Jam. For more information please visitwww.IcewineFestivals.com and follow it on Twitter@NFFestivals. The Scotiabank Convention Centre transforms into a winter wonderland for the 2016 Niagara Falls Icewine Festival from January 29th through 31st. Cozy up to loved ones as you sip your way through premium VQA wines and icewines from over 20 of Niagara's exceptional wineries.